It's inevitable that minor maintenance and repairs are going to be needed on your home throughout its life. Bathroom caulking and light bulbs will need replacing and door screens will need to be fixed and much more. However, with all of today's demands on your family's schedule, it's often difficult to find the time for these repairs. With the availability of the Sears Handyman Services, you are able to spend what precious time you do have being with your family. The technicians at Sears Handyman Services are trained and background checked for your safety and peace of mind. Therefore, whether you have just moved in or are a seasoned homeowner, a Sears Handyman Services technician is ready to work for you. Give us a call at (409) 356-3145. Electrician services are expensive and time-consuming. When you use the Sears Handyman Services for your electrical needs, you get a skilled technician. Technicians will take care of installing everything from recess lighting to replacing ceiling fans. Sears Handyman Services also provides services in light fixture repair and replacement. With new LED lighting systems and dimmer switch choices available to the homeowner, you can update your lighting fixtures with a quick call to Sears Handyman Services. Drywall, one of the most versatile materials in your home, can take a lot of abuse throughout the years, from chips from moved furniture to doorknob crashes. When you need drywall repair, replacement, taping or patching, Sears Handyman Services is at your service. Building custom decks or refinishing an existing deck is all part of the Sears Handyman Services menu. The technicians are equipped and trained to build a new deck or replace deteriorated boards from an existing deck, as well as staining and coating for protection against future wear. So when your deck is looking ragged, call Sears Handyman Services, and your deck will be ready for entertaining when you are. Household privacy is important, and having a beautiful wood fence encircling your property can add peace and tranquility. Or if you prefer, a chain link fence can offer a boundary with a view. This way, pets can roam your yard without you worrying. Whatever you choose, the technicians at Sears Handyman Services can build, repair, or replace property fencing. Painting gives your home's interior or exterior noticeable renewal. It helps restore beauty and design to an aging house. 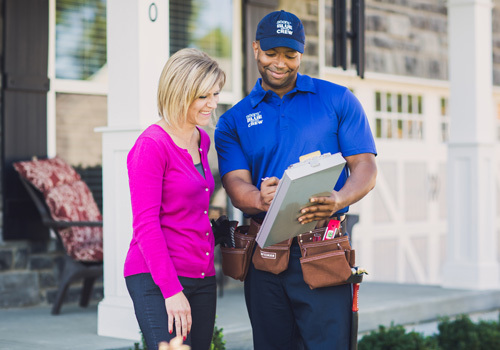 With Sears Handyman Services, you can sit back and relax while the technicians paint the exterior or interior of your home. Don't worry about climbing ladders and taping windows; our technicians will prep, paint and clean up, so you don't have to.